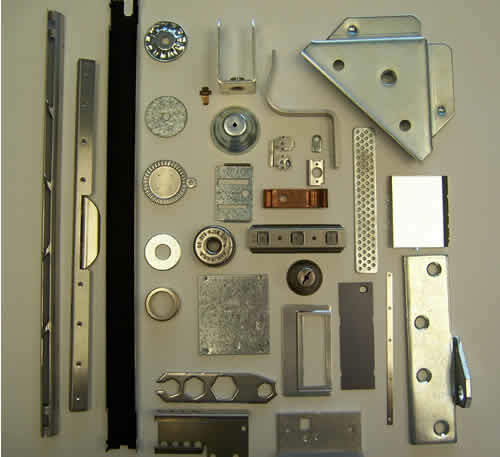 Our long-time focus of business has been custom-made metal stampings. The presses we have in house range from 15 to 150 tons with capabilities including progressive, compound and single-station blanking, drawing and forming dies. All are suited for short-run to high-volume jobs. We stamp a variety of materials, including cold-rolled steel, stainless steel, galvanized steel, spring-tempered steel, high-carbon steel, hot-rolled pickled & oiled (HRPO) aluminum, brass, copper and inconel, to name a few. Some examples of products made include: plates, brackets, clamps, fasteners, and electrical contacts. We currently produce parts with material thickness ranging from .005″ to .250″ thick, and overall part size of up to 24″ wide. Quality is of foremost importance in everything we do. We are committed to creating successful relationships with our customers by exceeding expectations for product quality and service.